Looking for a cheap alternative for a PDA? Instead of buying a Moleskine, you’d like a thinner version? Or you don’t want to risk your expensive tools to take with you to a party, a trip or a meeting? Or you are looking for a free, recyclable Personal Organizer? Then PocketMod is probably for you! What is the PocketMod? It is a small book with guides on each page in which you arrange stuff. 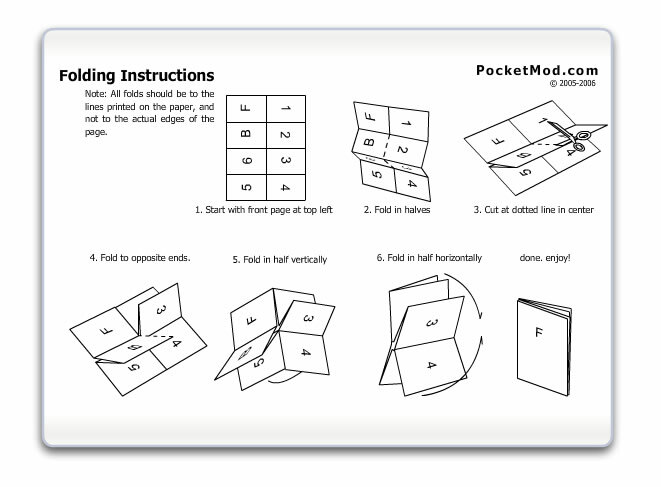 You combine several templates with a unique folding style, enabling a normal piece of paper to become your ultimate Personal Organizer. 2. Customize each widget and drag it to the right page. So many times I’ve talked about Slideshare during trainings and workshops, but it seems that still too few people have heard about it. Slideshare is basically a website where you can upload and share all your Powerpoint presentations. Also pdf files and Word documents. Besides sharing your content and your message with the world you can also keep them private or share them with your innercircle only. Why should you use it? Well, you can learn a lot from the newly updated presentations. On top of that, I sometimes use it for sharing my slides after a speech or event. People find it easy to go over them again or even download them. By uploading your documents you will improve your visibility to a bigger audience. If people are researching your topic, they might find it on Slideshare. And did I mention it’s free? Another benefit is your improved Google rankings. Thanks to Slideshare your presentations will be positioned high(er) in the search results. You only need to define your keywords well…Many people spend fortunes on Search Engine Optimisation (SEO) and with Slideshare you can profit from their rankings for free. They take your presentation to a new level on Google. Finally, you can also follow others or be followed (like Twitter) on Slideshare. Very interesting if you want to be on top of things. Follow your favourite topics and people on Slideshare as well. Who knows, you might build a following yourself too! And to really wrap it up, I am showing you how you can perfectly integrate your Slideshare presentation in your blog. You are currently browsing the BERT VERDONCK, lifehacker & networking coach blog archives for February, 2010.